This lease is designed for a bank that occupies a portion of the ground floor of a suburban office building or complex. The bank also leases a separate area for its ATM machine on the first floor lobby of the building. The lease gives the tenant protection that there will be no other banks in the complex containing the premises. If the landlord leases space to another bank, this tenant's minimum rent drops to half of the minimum rent specified in the lease. The tenant also has a rental abatement for a portion of the rent for a specified number of months following its occupancy of the premises. Exhibits included: Rules and Regulations, Work Letter, Schedule of Removable Property. Landlord and Tenant acknowledge the existence of a banking driveway for the purpose of permitting vehicular access by Tenant's banking customers to the exterior banking teller window along the westerly exterior façade of the building together with a canopy over the teller window area. Tenant shall have the right, at Tenant's sole cost and expense, to install new directional signage for the banking driveway provided that any such signage shall be subject to the review and approval of Landlord and local governing authority. The costs of maintaining and repairing the banking driveway and the landscaping adjoining same shall be included in Expenses under this Lease except that Tenant shall be responsible for the cost of any seal coating applied to the banking driveway. Any electric current consumed in connection with the lighting of the banking driveway and the operation of any equipment shall, for purposes of the reimbursement provisions of this Lease, be deemed to be consumed by Tenant in the Premises. Tenant shall be solely responsible for the costs of maintaining and repairing the canopy. The banking driveway shall be deemed a part of the Premises. Notwithstanding anything to the contrary contained herein, in the event Tenant ceases to operate a banking institution in the Premises for a period of three consecutive months or more (other than a closure due to repairs, remodeling or fire or other casualty), Tenant shall remove the drive-through window and bay equipment to the reasonable satisfaction of Landlord. 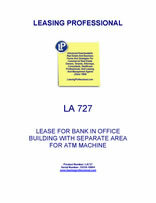 A. Landlord leases to Tenant and Tenant accepts the space located in the Building lobby as depicted on Exhibit A-1 (the "ATM Space") for Tenant's operation of an ATM (as defined below) during the Term of this Lease. Landlord (as part of the Landlord Work as defined in Exhibit D attached hereto) shall remove and dispose of Tenant's ATM existing in the exterior of the Building as of the date hereof. Tenant, at its sole cost and expense, shall purchase and install a new ATM in the Building lobby in the ATM Space. B. "Permitted Use": The ATM Space shall be used only for the operation of one automatic teller machine ("ATM") for dispensing cash; processing withdrawals, deposits, transfers and advances; facilitating inquiries and requests about a user's account; and such other transactions as are normally conducted by ATMs that are (i) located in the lobbies of office buildings comparable to the Building in the ____________ area and (ii) owned by other national banking institutions; provided such other transactions do not conflict with any exclusive use covenant granted by Landlord to any other tenant or occupant of the Building and do not constitute a disturbance to other tenants in the Building or injure the reputation of the Building, as determined by Landlord in its reasonable discretion. The ATM Space shall be used for no other use or purpose whatsoever. C. The ATM to be installed by Tenant in the ATM Space shall be subject to Landlord's reasonable approval and Tenant, at its expense, shall prepare and deliver to Landlord for Landlord's approval a set of final plans and specifications for such ATM. Tenant's construction and installation of the ATM or any improvements in the surrounding area shall be performed in accordance with Laws and shall otherwise be in accordance with the terms of Section IX.C. of the Lease. D. Landlord agrees to furnish Tenant electricity to the ATM Space only in accordance with and subject to the terms and conditions in this Lease. Landlord's failure to furnish, or any interruption or termination of electrical services due to the application of Laws, the failure of any equipment, the performance of repairs, improvements or alterations, or the occurrence of any other event or cause shall not render Landlord liable to Tenant, constitute a constructive eviction of Tenant, give rise to an abatement of Rent nor relieve Tenant from the obligation to fulfill any covenant or agreement under this Lease. Any electric current consumed in connection with the operation of the ATM and related equipment shall, for purposes of the reimbursement provisions of this Lease, be deemed to be consumed by Tenant in the Premises. Tenant's use of electrical service in connection with the ATM or the ATM Space shall not exceed, either in voltage, rated capacity, or overall load, that which Landlord deems to be standard for the Building, although it is understood that electricity shall be supplied to the ATM 24 hours a day, 7 days a week, subject to the other terms and provisions of this Lease. E. The ATM shall be owned by Tenant. At all times during the Term, as same may be extended, Tenant, at its cost, shall maintain in good, clean, safe and working condition, the ATM, the ATM Space and the areas surrounding the ATM Space, including, without limitation, all equipment and fixtures installed which exclusively serve the ATM or the ATM Space. All such repairs and maintenance shall be performed in accordance with the terms of Section IX.A. of the Lease. Tenant shall not make alterations, additions or improvements to the ATM, ATM Space or other portions of the Building affecting the ATM without first obtaining the written consent of Landlord in each instance, which consent may be withheld at Landlord's sole and absolute discretion. Tenant shall keep the ATM in operation at least during Normal Business Hours. F. All terms and provisions of the Lease shall be applicable to the ATM and the ATM Space, including, without limitation, Article XII (Assignment and Subletting), Article XIV (Indemnity and Waiver of Claims) and Article XV (Tenant's Insurance), except as specifically described otherwise herein and except that Landlord shall not supply air-cooling, heat, water, janitorial service, cleaning, passenger or freight elevator service or window washing to the ATM or the ATM Space and Tenant shall not be entitled to any work allowances, rent credits, expansion rights or renewal rights with respect to the ATM unless such concessions or rights are specifically provided for herein with respect to the ATM. Landlord shall not be liable for any theft or damage to the ATM or any items or materials with respect to the ATM. G. Tenant, at its expense, shall maintain all permits and licenses and observe and comply with all Laws relating to the ATM. Tenant shall provide all security measures for the ATM which are customary for an automatic teller machine similar to the ATM described herein, including without limitation, adequate lighting. Tenant shall comply with all Laws and regulations as they pertain to safety for operation of ATM facilities, to the extent applicable, and any other applicable statutes, laws or regulations, including governmental restrictions. H. Upon expiration or sooner termination of the Term, Tenant agrees to remove the ATM and related improvements and restore the affected area to the condition prior to installation of the ATM, reasonable wear and tear excepted, at Tenant's expense, and the terms and provisions of Article VIII of this Lease shall apply with respect to Tenant's removal, repair and restoration obligations described in this Section H.